This gorgeously written novel takes place in the small township of Liberty in East Texas during the 1950s, ‘60s, and ‘70s. Ephraim and Ruby were playmates as children, but when Ruby returns to Liberty after nearly twenty years of living in New York, nobody can fathom the demons from her past that still haunt her. This astonishing and self-assured debut is reminiscent of early Toni Morrison and Edwidge Danticat, by way of all of the great Southern writers who know that there is no place like, and no place more complicated than, home. A New York Times bestseller and Oprah Book Club 2.0 selection, the epic, unforgettable story of a man determined to protect the woman he loves from the town desperate to destroy her. This beautiful and devastating debut heralds the arrival of a major new voice in fiction. Ephram Jennings has never forgotten the beautiful girl with the long braids running through the piney woods of Liberty, their small East Texas town. Young Ruby Bell, "the kind of pretty it hurt to look at," has suffered beyond imagining, so as soon as she can, she flees suffocating Liberty for the bright pull of 1950s New York. Ruby quickly winds her way into the ripe center of the city--the darkened piano bars and hidden alleyways of the Village--all the while hoping for a glimpse of the red hair and green eyes of her mother. When a telegram from her cousin forces her to return home, thirty-year-old Ruby finds herself reliving the devastating violence of her girlhood. With the terrifying realization that she might not be strong enough to fight her way back out again, Ruby struggles to survive her memories of the town's dark past. Meanwhile, Ephram must choose between loyalty to the sister who raised him and the chance for a life with the woman he has loved since he was a boy. Full of life, exquisitely written, and suffused with the pastoral beauty of the rural South, Ruby is a transcendent novel of passion and courage. This wondrous page-turner rushes through the red dust and gossip of Main Street, to the pit fire where men swill bootleg outside Bloom's Juke, to Celia Jennings's kitchen, where a cake is being made, yolk by yolk, that Ephram will use to try to begin again with Ruby. 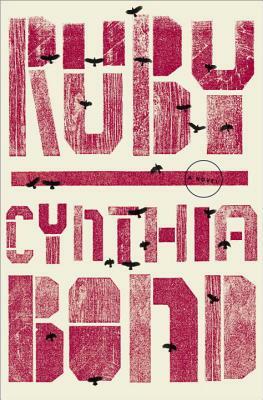 Utterly transfixing, with unforgettable characters, riveting suspense, and breathtaking, luminous prose, Ruby offers an unflinching portrait of man's dark acts and the promise of the redemptive power of love. Ruby was a finalist for the PEN America Robert Bingham Debut Novel Award, a Barnes & Noble Discover Great New Writers selection, and an Indie Next Pick. CYNTHIA BOND has taught writing to homeless and at-risk youth throughout Los Angeles for more than fifteen years. She attended Northwestern University's Medill School of Journalism, then moved to New York and attended the American Academy of Dramatic Arts. A PEN/Rosenthal Fellow, Bond founded the Blackbird Writing Collective in 2011. At present, Bond teaches therapeutic writing at Paradigm Malibu Adolescent Treatment Center. A native of East Texas, she lives in Los Angeles with her daughter.